NASAM (National Approach to Standardize and Improve Mechanical Ventilation) is a national collaborative quality improvement project in Saudi Arabia. It aims to improve the care of mechanically ventilated patients by implementing evidence-based practices with the goal of reducing the rate of ventilator-associated events and therefore reducing mortality, mechanical ventilation duration and intensive care unit (ICU) length of stay. The project plans to extend the implementation to a total of 100 ICUs in collaboration with multiple health systems across the country. As of March 22, 2019, a total of 78 ICUs have registered from 6 different health sectors, 48 hospitals, and 27 cities. The leadership support in all health sectors for NASAM speaks of the commitment to improve the care of mechanically ventilated patients across the kingdom. In 2013, the Armstrong Institute for Patient Safety and Quality at the Johns Hopkins Hospital launched the Comprehensive Unit-based Safety Program (CUSP) for improving the care of mechanically ventilated patients (CUSP 4 MVP project)., A cohort of 15 ICUs from six hospitals in Saudi Arabia participated collaboratively with this project between September 2015 and December 2016. The project included multiple interventions (CUSP team formation, training, audit, and feedback) to improve several aspects of the care of mechanically ventilated patients following evidence-based guidelines. Over a relatively short period of time, there was a significant improvement in key indicators of the care of mechanically ventilated patients with a trend toward reduction in mortality. This project demonstrated the feasibility of performing a multicenter quality improvement project. A large-scale project with a longer duration may lead to major impact on the care of mechanically ventilated patients in Saudi Arabia. In sustaining much of these efforts, we plan to extend the implementation to a total of 70–100 ICUs in collaboration with multiple health systems across the country. The objective is to improve the care of mechanically ventilated patients and eliminate preventable harm associated with mechanical ventilation (MV). A significant component of this project includes measuring the safety culture of ICUs, which is one of the Ministry of Health indicators for Vision 2030. 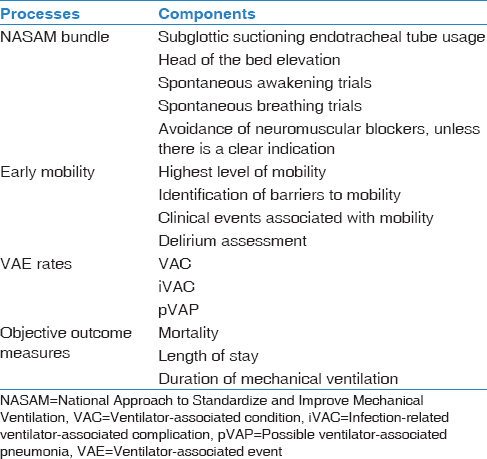 The National Approach to Standardize and Improve Mechanical Ventilation (NASAM) is a national collaborative quality improvement project in Saudi Arabia which aims to improve the care of mechanically ventilated patients by implementing evidence-based practices with the goal of reducing the rate of ventilator-associated events (VAEs) and therefore reducing mortality, MV duration, and ICU length of stay. Over the course of 2 years, ICU teams from different hospitals will work simultaneously through the NASAM project. This data-driven project includes generating data on key performance indicators, attending workshops and biweekly online training sessions, and leading on local safety efforts to reduce patient harm. Participating teams are invited to join the NASAM project web portal which provides educational materials for frontline staff, infection control practitioners, and allied health-care professionals; evidence-based toolkits; data collection tools to evaluate local practices; and a robust web-based data platform to generate real-time data reports. Participating ICUs can track their performance over time and compare their performance with others. Reports can be shared with the team members, frontline staff, and hospital leaders to sustain engagement in the program. The project focuses on driving change to improve the compliance with evidence-based practices through technical and adaptive improvement. Evidence suggests that the early mobilization of critically ill patients can reduce the physical and neurocognitive impairments in ICU survivors. It can result in reduced length of stay and decreased degree of delirium. Although the mobilization of ICU patients at early stages seems to be safe and effective, it is not without risk. Problems with mobilization could occur and lead to injuries such as catheter dislodgement and equipment disconnections. In order to maximize the benefits of early mobilization intervention, it is crucial to understand the barriers to compliance, which can be related to the awareness level of ICU clinicians, agreement among clinicians on its implementation, and availability of equipment required for this intervention. All these elements will be monitored in the NASAM project [Table 1]. Data-driven change: The technical improvement involves using data to drive change. Education and training: Workshops and educational webinars that will be conducted biweekly will provide education and training on the best practices in patient safety and on improving the care of mechanically ventilated patients. The topics will include the aspects listed in [Table 2]. Coaching, audit, and feedback: The NASAM project supports frontline teams by structured team coaching to learn and practice improvement tools. This will be implemented using the concepts of CUSP to improve patient safety awareness and system thinking at the unit level. The CUSP approach was developed by patient safety researchers at the Johns Hopkins Hospital (Baltimore, MD, USA) and was designed to improve local safety cultures and to guide to learn from mistakes by utilizing a structured framework. This approach has been linked to large-scale reductions in healthcare-acquired infections,,,,, mortality, and associated costs. All the participating units are requested to create a dedicated CUSP team. These teams should include at minimum a local physician and a nursing and a respiratory therapy champion. The CUSP team should meet regularly to discuss patient safety issues in the unit. How is the next patient likely to be harmed on our unit and what do you think we could do to prevent that harm? On our unit, how do you think we can get patients of the mechanical ventilator faster? What could you do to reduce risk? How do you know that the risk was reduced? We will use the Hospital Survey on Patient Safety Culture (HSOPSC) sponsored by the Agency for Healthcare Research and Quality. 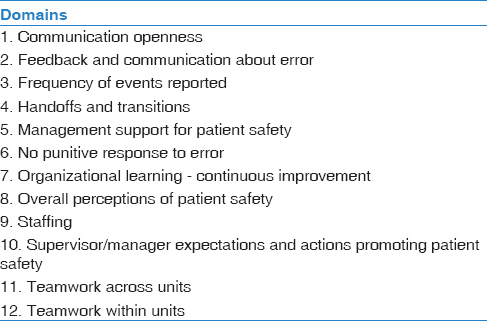 The survey includes 42 items that measure 12 composites of patient safety culture. The HSOPSC domains are summarized in [Table 3]. As of March 22, 2019, a total of 78 ICUs have registered for the NASAM [Figure 1], with around 60% started collecting NASAM indicators. The registered ICUs were from 6 different health sectors, 48 hospitals, and 27 cities. In January, there were data collected on more than 5000 patient-days. The leadership support in all health sectors speaks of the commitment to improve the care of mechanically ventilated patients across the Kingdom. Recorded lectures, powerpoint presentations, related documents, and protocols will be made available through the NASAM website. The NASAM project is a quality improvement initiative aimed at improving the care of mechanically ventilated patients at a large scale in Saudi Arabia. Collaboration and culture of safety are key features of this project. Arabi Y, Al-Shirawi N, Memish Z, Anzueto A. Ventilator-associated pneumonia in adults in developing countries: A systematic review. Int J Infect Dis 2008;12:505-12. Al-Tawfiq JA, Amalraj A, Memish ZA. Reduction and surveillance of device-associated infections in adult intensive care units at a Saudi Arabian hospital, 2004-2011. Int J Infect Dis 2013;17:e1207-11. Al-Thaqafy MS, El-Saed A, Arabi YM, Balkhy HH. Association of compliance of ventilator bundle with incidence of ventilator-associated pneumonia and ventilator utilization among critical patients over 4 years. Ann Thorac Med 2014;9:221-6. Al-Dorzi HM, El-Saed A, Rishu AH, Balkhy HH, Memish ZA, Arabi YM, et al. The results of a 6-year epidemiologic surveillance for ventilator-associated pneumonia at a tertiary care intensive care unit in Saudi Arabia. Am J Infect Control 2012;40:794-9. Al-Tawfiq JA, Abed MS. Decreasing ventilator-associated pneumonia in adult intensive care units using the institute for healthcare improvement bundle. Am J Infect Control 2010;38:552-6. Khan R, Al-Dorzi HM, Al-Attas K, Ahmed FW, Marini AM, Mundekkadan S, et al. The impact of implementing multifaceted interventions on the prevention of ventilator-associated pneumonia. Am J Infect Control 2016;44:320-6. Rawat N, Yang T, Ali KJ, Catanzaro M, Cohen MD, Farley DO, et al. Two-State Collaborative Study of a Multifaceted Intervention to Decrease Ventilator-Associated Events. Crit Care Med 2017;45:1208-15. Agency for Healthcare Research and Quality. Toolkit To Improve Safety for Mechanically Ventilated Patients. http://www.ahrq.gov/professionals/quality-patient-safety/hais/tools/mvp/index.html. [Last accessed on 2019 Mar 24]. Khan RM, Aljuaid M, Aqeel H, Aboudeif MM, Elatwey S, Shehab R, et al. Introducing the Comprehensive Unit-based Safety Program for mechanically ventilated patients in Saudi Arabian Intensive Care Units. Ann Thorac Med 2017;12:11-6. Edrees HH, Al Aseri Z, Mandourah Y, Yousef A, Qushmaq I, Maghrabi KA, et al. Commitment to collaborate: The value of establishing multicenter quality improvement collaboratives in Saudi Arabia. Saudi Crit Care J 2017;1:7-9. Klompas M, Branson R, Eichenwald EC, et al. Strategies to prevent ventilator-associated pneumonia in acute care hospitals: 2014 update. Infect Control Hosp Epidemiol 2014;35:915-36. Klompas M, Anderson D, Trick W, et al. The preventability of ventilator-associated events. The CDC Prevention Epicenters Wake Up and Breathe Collaborative. Am J Respir Crit Care Med 2015; 191(3): 292-301. Devlin JW, Skrobik Y, Gelinas C, et al. Clinical Practice Guidelines for the Prevention and Management of Pain, Agitation/Sedation, Delirium, Immobility, and Sleep Disruption in Adult Patients in the ICU. Crit Care Med 2018;46:e825-e73. Pun BT, Balas MC, Barnes-Daly MA, et al. Caring for Critically Ill Patients with the ABCDEF Bundle: Results of the ICU Liberation Collaborative in Over 15,000 Adults. Crit Care Med 2019;47:3-14. Engel HJ, Needham DM, Morris PE, Gropper MA. ICU early mobilization: From recommendation to implementation at three medical centers. Crit Care Med 2013;41:S69-80. Berenholtz SM, Lubomski LH, Weeks K, Goeschel CA, Marsteller JA, Pham JC, et al. Eliminating central line-associated bloodstream infections: A national patient safety imperative. Infect Control Hosp Epidemiol 2014;35:56-62. Berenholtz SM, Pham JC, Thompson DA, Needham DM, Lubomski LH, Hyzy RC, et al. Collaborative cohort study of an intervention to reduce ventilator-associated pneumonia in the intensive care unit. Infect Control Hosp Epidemiol 2011;32:305-14. Latif A, Kelly B, Edrees H, Kent PS, Weaver SJ, Jovanovic B, et al. Implementing a multifaceted intervention to decrease central line-associated bloodstream infections in SEHA (Abu Dhabi Health Services Company) intensive care units: The Abu Dhabi experience. Infect Control Hosp Epidemiol 2015;36:816-22. Pronovost PJ, Watson SR, Goeschel CA, Hyzy RC, Berenholtz SM. Sustaining Reductions in Central Line-Associated Bloodstream Infections in Michigan Intensive Care Units: A 10-Year Analysis. Am J Med Qual 2016;31:197-202. Lipitz-Snyderman A, Steinwachs D, Needham DM, Colantuoni E, Morlock LL, Pronovost PJ, et al. Impact of a statewide intensive care unit quality improvement initiative on hospital mortality and length of stay: Retrospective comparative analysis. BMJ 2011;342:d219. Waters HR, Korn R Jr., Colantuoni E, Berenholtz SM, Goeschel CA, Needham DM, et al. The business case for quality: Economic analysis of the Michigan keystone patient safety program in ICUs. Am J Med Qual 2011;26:333-9. Centers for Disease Control and Prevention. Ventilator-Associated Event. Available from: http://www.cdc.gov/nhsn/PDFs/ pscManual/10-VAE_FINAL.pdf. [Last accessed on 2019 Mar 23]. Klompas M. Complications of mechanical ventilation – The CDC's new surveillance paradigm. N Engl J Med 2013;368:1472-5. Klompas M, Kleinman K, Murphy MV. Descriptive epidemiology and attributable morbidity of ventilator-associated events. Infect Control Hosp Epidemiol 2014;35:502-10. Zhu S, Cai L, Ma C, Zeng H, Guo H, Mao X, et al. The clinical impact of ventilator-associated events: A prospective multi-center surveillance study. Infect Control Hosp Epidemiol 2015;36:1388-95. Klompas M, Khan Y, Kleinman K, Evans RS, Lloyd JF, Stevenson K, et al. Multicenter evaluation of a novel surveillance paradigm for complications of mechanical ventilation. PLoS One 2011;6:e18062. Klompas M, Kleinman K, Khan Y, Evans RS, Lloyd JF, Stevenson K, et al. Rapid and reproducible surveillance for ventilator-associated pneumonia. Clin Infect Dis 2012;54:370-7. Prospero E, Illuminati D, Marigliano A, Pelaia P, Munch C, Barbadoro P, et al. Learning from Galileo: Ventilator-associated pneumonia surveillance. Am J Respir Crit Care Med 2012;186:1308-9. Hayashi Y, Morisawa K, Klompas M, Jones M, Bandeshe H, Boots R, et al. Toward improved surveillance: The impact of ventilator-associated complications on length of stay and antibiotic use in patients in intensive care units. Clin Infect Dis 2013;56:471-7. Cawcutt KA. Shifting the Paradigm: Preventing More Than Infection. Infect Control Hosp Epidemiol 2018; 39(6): 644-6. Agency for Healthcare Research and Quality. Hospital Survey on Patient Safety Culture. Content last reviewed January 2019., http://www.ahrq.gov/sops/surveys/hospital/index.html. [Last accessed 2019 Mar 24].